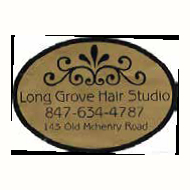 Come by Long Grove Hair Studio and meet owner Laurie Spinelle. This full-service hair salon has a fresh look, a team of talented, skillful stylists, and an experienced manicurist all with the same goal: to use their talents and professional expertise to make you and your family look your very best. Visit this upscale shop in Long Grove’s historic business district whether you are looking for a new everyday style or something for that special occasion. See them before your wedding, prom or other special event. It’s a convenient, full-service salon for the whole family offering the latest styles, colors and cuts.